April 23, 2013 | 12:47 p.m.
Wallace Boeve (third from the left), director of the PA program, speaks with trustees last year about the new program. 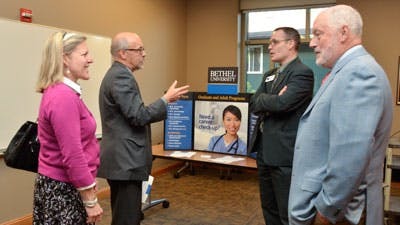 The new physician assistant program in the Graduate School at Bethel University has received provisional accreditation approval from the Accreditation Review Commission on Education for the Physician Assistant (ARC-PA), allowing the first class of students to be admitted. ARC-PA withheld provisional accreditation a few weeks ago and requested additional information, which was submitted and has now been approved. The Master of Science in Physician Assistant (PA) program will begin in June and is only the third program offered in the state of Minnesota. The PA program will enroll its inaugural class of 32 students from more than 200 applicants. The screening and interview process for the inaugural class was completed in early January. It is a strong pool of students both academically from a variety of health care experiences, says Wallace Boeve, director of the PA program. 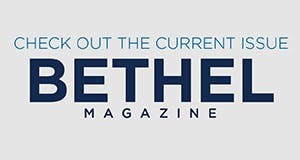 All students who attend and graduate from Bethel’s PA program under the provisional accreditation will be considered by accrediting, government and medical organizations as having received a fully accredited PA degree, Crombie explains. Additionally, the program has applied for appropriate Higher Learning Commission accreditation status, and has met the Minnesota Department of Education requirements. The PA degree at Bethel will be a 27-month, full-time master's program designed to give physician assistants a foundational, generalist training that prepares them for all areas of medicine. Through coursework, lab sessions, and clinical rotations, the program will train students to diagnose patients, treat diseases, prescribe medications, and assist with preventive care. In addition to Boeve as program director, Gregory Ekbom ’71 has started as the director of clinical education, Daniel Leafblad ’74 will serve as the part-time medical director, and Amy Bronson and Christina Hanson ’01 will be assistant professors in the PA program. Adding the PA program at the Graduate School is part of a larger university strategic plan to expand Bethel’s presence in health sciences. The university already has a long-standing tradition of solid health science and nursing programs in the College of Arts & Sciences and the College of Adult & Professional Studies as well as the M.S. in Nursing at the Graduate School.